After the detention of critical authors and journalists, Interpol came under criticism. All arrest warrants should be reviewed retroactively for possible political persecution. German authorities promised to check incoming warrants more strictly. Little has happened since then. In police investigations, the border to political or religious persecution is sometimes blurred. This becomes particularly critical when international warrants come from non-democratic countries. 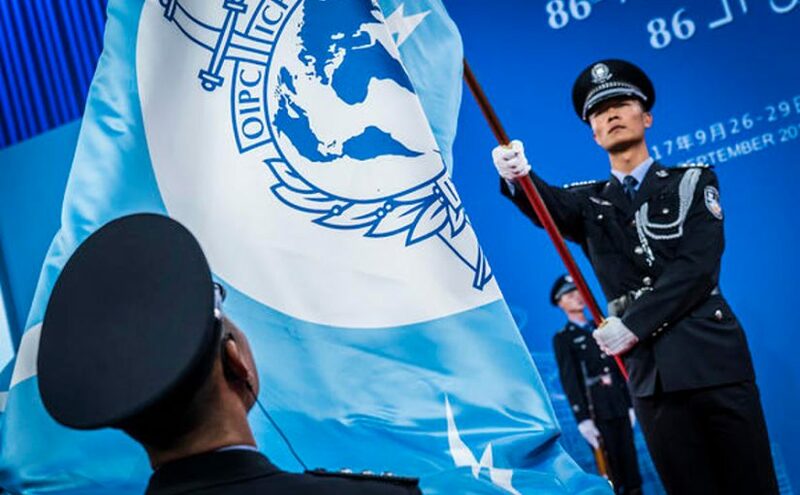 In order not to transform the Interpol authority into an instrument of political persecution, it is therefore strictly forbidden „to undertake any intervention or activities of a political, military, religious or racial character“. However, this does not prevent some countries from issuing searches or, as in the case of Germany, from playing the game in some cases. Since 2014, Interpol’s General Secretariat has noted that 130 arrest warrants have been distributed in violation of Article 3 of the Statutes. The search and extradition requests are therefore considered political persecution. All 190 member countries have been informed about this and asked to annul the warrants in question. 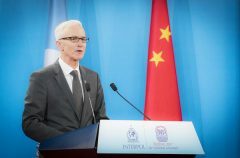 Former German BKA Vice Chairman Jürgen Stock has been Secretary General at Interpol since 2014. Nevertheless, five persons on this list in Germany are still wanted through the German Federal Criminal Police Office (BKA). This was announced by the Federal Ministry of Justice and Consumer Protection in its answer to a parlamentarian question. The Federal Office of Justice and the Federal Foreign Office had decided on each warrant by a mutual agreement. It is not known who the persons concerned are or from which countries the warrants originate. So far, no arrest has taken place in any of the cases. To the question of which countries the five requests come from, the ministry responds with the utmost secrecy. The international criminal police organisation manages the so-called „Red Notices“, in which people are wanted for capture. The ban on the use of „Red Notices“ for political persecution applies to the police issuing the alert, but not to the authority that receives it. The German authorities are therefore not formally bound by an Article 3 decision of the General Secretariat in Lyon. In addition to the „Red Notice“, there are also the colours yellow (missing persons), black (dead), green (warnings) and blue (request for the whereabouts of the persons in question). The Interpol announcement that the Egyptian arrest warrant for Ahmed Mansour is probably politically motivated. In recent years, German authorities have repeatedly expressed an opposite view to international arrest warrants. Three years ago, the Federal Police arrested the Egyptian-British journalist Ahmed Mansour at Berlin Tegel Airport. 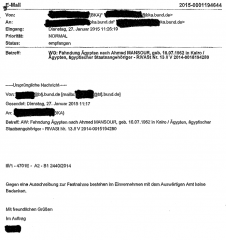 The process is well documented by a German FOIA request: In accordance with the usual procedure, the arrest was reported to the Office of the Attorney General. The British and Egyptian embassies were also informed. The Federal Police had remarkably written that Mansour had been arrested on the basis of the existing „international arrest warrant“. However, it was an exclusively German manhunt, as the FOIA inquiry shows. An Egyptian request for detention was previously distributed by the Egyptian authorities as a „Red Notice“ via Interpol to the affiliated central offices of the Member States. Two weeks after receiving the Egyptian request, however, Interpol had noted a political persecution and informed all national central offices. Mail from the Federal Office of Justice, according to which there are „no objections“ to the national arrest warrant for Ahmed Mansour. The responsible BKA did not immediately delete the warrant „due to its political significance“, but submitted it to the Federal Office of Justice and the Federal Foreign Office for a decision on its national implementation. Two months later, the BKA received notification from the two bodies that there were „no objections“ to a German search for arrest. It then initiated the national arrest warrant in the German INPOL system. In 2014, Interpol had called on all states to report suspected cases of political persecution within the framework of „Red Notices“. In the same year, the Fair Trials organisation presented a critical report on political persecution via Interpol and named numerous individual cases. According to research by German media outlets, some people had indeed been removed from Interpol’s search list. But the BKA had not participated in the cleanup: allegedly for data protection reasons. Finally, in September 2015, the Ministry of Justice and Consumer Protection organised a workshop on the processing of international warrants. As a result, it was decided that the Federal Office of Justice would report a possible violation of Article 3 to the ministry upon receipt of an Interpol notification. There, the legal requirements are checked again. 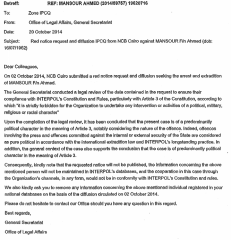 Following the temporary detention of Doğan Akhanlı last year in Spain, the European Commission discussed the abuse Interpol for political persecution with several Member States, including Germany, Belgium and Spain. The background were also the arrest warrants from Turkey, which, after the coup d’état in 2016, distributed a „Blue Notice“ in at least 39 cases to find out where they were staying via Interpol. After the change of government in 2014, the Interpol national offices also received 1,569 „Red Notices“ and 487 „Blue Notices“ from Ukraine. However, only 16 of these requests were considered by Interpol as an abuse of Article 3. Last autumn, the EU Commission was to hold a workshop to develop a joint approach by the member states on politically motivated search requests. As far as known, the event has not yet taken place. Interpol also wanted to retrospectively check every 40,000 „Red Notice“ for possible political persecution. No execution has been reported from Lyon yet.